Prime Minister Sheikh Hasina today awarded 10 players and one official of Bangladesh Under-18 Women Football Team for clinching the SAFF U-18 Championship-2018. The prime minister handed over cheques for the award to them at her office in the capital this afternoon. She gave Tk one lakh each of the 10 players and Tk 5 lakh to the official of the team. 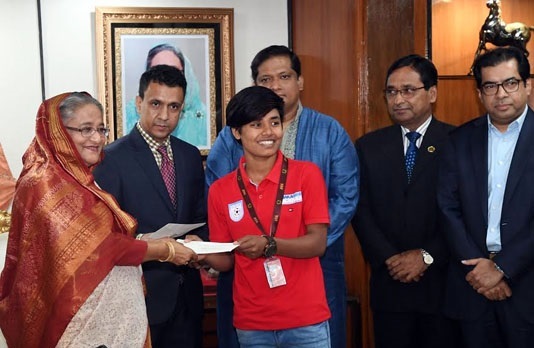 Earlier on October 11, the prime minister accorded a reception to the Bangladesh U-18 Women Football Team at Ganabhaban and awarded its 19 members out of 30. The remaining members of the squad were awarded today. Bangladesh U-18 Women Team became unbeaten champion in the first edition of the SAFF tournament defeating Nepal by 1-0 in the final at the Changlimithang Stadium in Thimphu on October 7 last.